In yesterday's Cyrsti's Condo post concerning what was coming up socially this week, I totally forgot about Friday. It is Liz's semi-formal martial arts banquet. Basically, I plan on wearing the same outfit I wore to the transgender-cross dresser Christmas party. 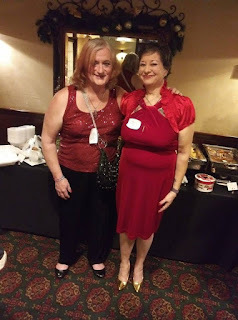 My red sequined sleeveless top and a pair of silky/slinky black slacks. It should work well with my black flats. The banquet itself is a mixed bag of good and less than good for me. Nearly everyone who goes gets an award of some sort (which is fine) except quite a few spouses like me. As we roll through the names, I plan on having a cup of coffee or two to stay in the game! The picture is from the Christmas Party. This time I plan wearing a "restraining" garment underneath the top to smooth out the whole look. Or, hide the fact I have not lost the "holiday" weight I gained. Of course the hair will be different and the breasts are all mine. Thanks HRT!